China, the US, and many other countries are examples of how the 21st century is thus far a story of urbanization. Population and production shifts from rural to urban areas have characterized modernization for centuries, but now these processes have truly gone global while the cumulative effects also are becoming increasingly evident. For the most part, those effects are positive. So it is that one can speak of progressive modernization, while proposals to move people in the other direction seem increasingly antique. But that doesn’t mean that people aren’t moving, or that all urbanization is progressive. The caption reports that we are looking at an aerial view of the Za’atari refugee camp near the Jordanian city of Mafraq, some five miles from the border with Syria. 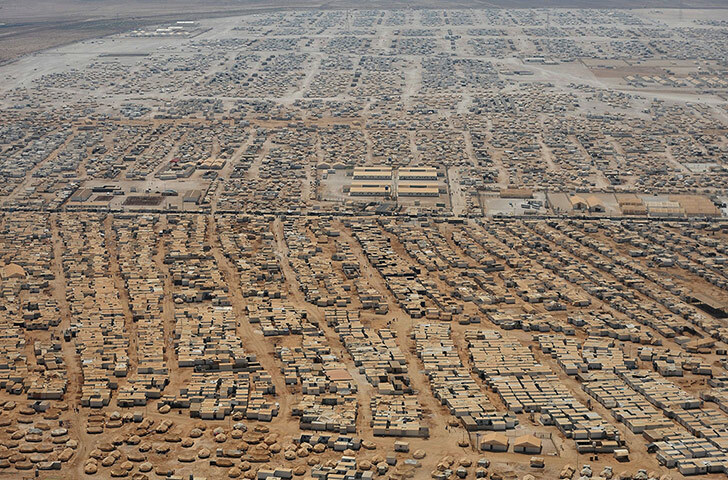 Some urbanists might already be crying “foul,” for a refugee camp isn’t a city. Except that it is. Even provisional cities are cities, and camps are provisional cities, right down to the street plan and organization of basic services. In fact, the tableau above might be interchangeable with illustrations of ancient cities or frontier cities or perhaps Chicago in the early days, although the relatively geometric layout is a dead giveaway that we are looking at modern design. All that is missing to be a city proper is permanency, and–as those living in the Occupied Territories can attest–camps can have a way of becoming permanent. But now I’ve gone too far. Much still is missing. 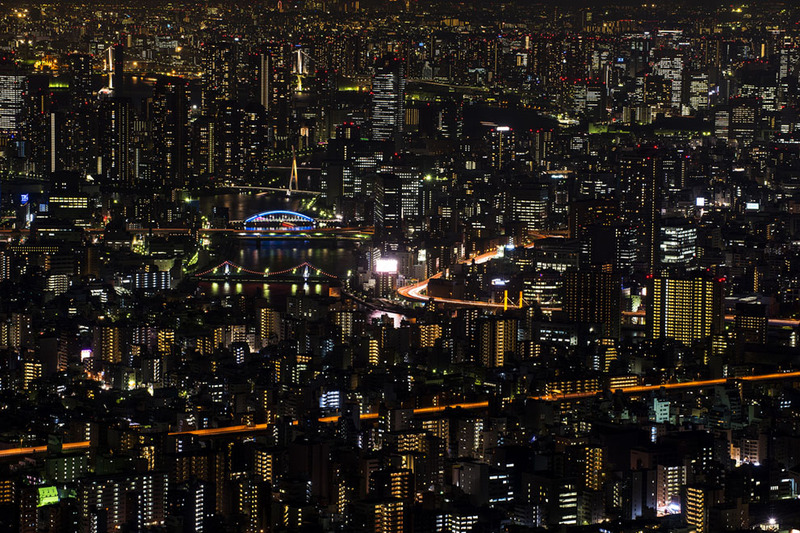 Way too much, as we can see by comparison with this photograph of Tokyo. I could have taken any one of thousands of magnificent cityscapes. Fortunately, they are a dime a dozen. The modern world has many very successful cities, and many affluent spectators who can take pictures by day and night throughout the year. These two images happened to be in the slide shows recently, and together they do reveal something that is only implicit in each alone. If the one image is a celebration of modern abundance and the technologies that sustain it, that is meaningful because of how it is the culmination of a narrative of progressive ascent from the state of nature and relentless scarcity evident in a desert. If the other image is more than a portrait of masses of people being warehoused in a desert, it is because the evident organization and infusion of resources through those channels implies a potential escape from scarcity and inertia. In an ideal world, camps would be disbanded and cities would thrive. Instead, some cities (like Aleppo) are being razed, and camps are growing. More generally, here as in many other sectors of global transformation, we seem to see a tale of two cities. Some win, others lose. Some thrive, others are pushed closer to catastrophe. Some cities continue to become larger, more productive, more rewarding, more alive. Other cities are being founded on very different principles–one can’t even say principles of development. These are human warehouses, holding pens, open air prisons–by now there may be many different versions of the same disaster. Of course, the camp is not the primary cause of its problems, even of its existence, but neither is the great city entirely the architect of its good fortune. Za’atari and Tokyo are each symptoms of different conditions, but they also are both symptoms of the same condition. Two cities, but one modern world. Continued urbanization may be the unstoppable, but it remains to be seen whether many of the cities to come will look more like a metropolis or a camp. Photographs by Mandel Ngan/AFP and Yoshiki Nakamura/National Geographic Traveler Photo Contest.